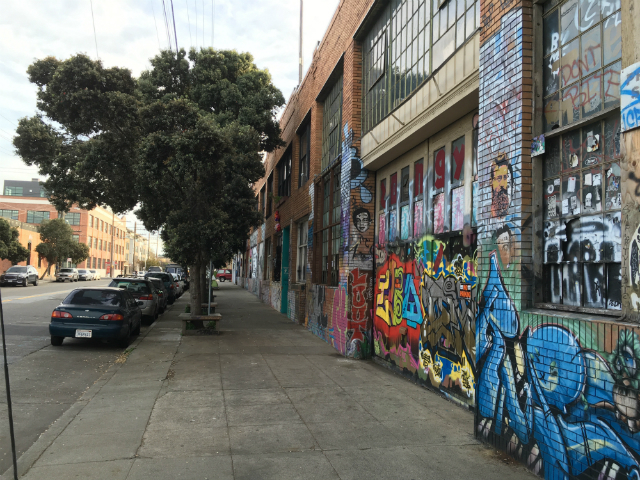 The almost block-long building that will be razed for new housing at 2000-2070 Bryant St. Photo: Joe Rivano Barros / Mission Local. The developer of an almost block-long housing complex on Bryant Street between 18th and 19th that has drawn the ire of Mission activists for the last 10 months has now agreed to dedicate one-third of its land to the city for affordable housing, giving up 22,750 square feet where the city can build an estimated 129 units for low and moderate-income tenants. But despite the land dedication, some community members remain in bitter opposition to what they see as an imperfect solution for more affordable housing and a process with little community input. “He is delusional if he thinks that having the city build his affordable housing requirement is going to fly with the community,” said Spike Kahn, founder of the arts space the Pacific Felt Factory, who has been involved against the so-called “Beast on Bryant” since its proposal. “There is no support for the project, and because it’s such a large scale project, it makes it even more important to not put it forward until we have a comprehensive policy [for the neighborhood],” added Gabriel Medina, a policy director with MEDA. The development, a block-long housing complex at 2000-2070 Bryant St. was previously slated to have 17 percent of its former 276 units be affordable. Developers of market-rate housing in San Francisco must build either 12 percent affordable housing on-site, 20 percent off-site, or pay an in-lieu fee. Those building in areas affected by the Eastern Neighborhoods Plan — which includes the Mission — can also choose a rarely-used land dedication option, in which a piece of land equivalent to 35-40 percent of the site is given to the city. The city then uses its own money — as well as state, federal, and tax-credit funds — to pay for the site, which would be built by a non-profit developer. Nick Podell, the site’s developer, chose the third route and dedicated 35 percent of his land to the city for affordable housing, resulting in an increase from 44 affordable units to a possible 129 units. Those units will be affordable to those making less than 60 percent of area median income, or $61,150 for a family of four, while the rest of the site will house 186 market-rate units and three rent-controlled ones. “It’s a dramatically different project than the one we initially proposed,” said Evette Davis, a spokesperson for Podell. The move means, however, that the city will have to pay for the housing itself and that it may take time before the project breaks ground — a move some saw as shifting the responsibility for affordable housing to the city. Davis acknowledged concerns with the project, but said the land dedication ultimately provided the city with a shovel-ready project that would yield more affordable units than otherwise. The Mayor’s Office of Housing and Community Development also prefers the land dedication option, saying the cost of land in the Mission District is so expensive it will allow them to build more units than they would by purchasing a parcel on their own. Using that estimate, the 130 units on Bryant Street would cost $31 million, though Hartley said there’s no telling how long it might take to finance the project. Only two other sites in San Francisco have been developed with a land dedication — 801 Brannan St. and 1296 Shotwell St. — and while the Shotwell site was awarded to a non-profit developer some three years after dedication, the Brannan site has still not been awarded. After that, construction can still take another three to four years. The development would join four other Mission projects — 490 South Van Ness, 1950 Mission, 2070 Folsom, and 1296 Shotwell — slated for fully affordable housing in the last seven months, bringing the total number of affordable units coming to the neighborhood in the next few years to some 571. And that does not include the 8 units recently purchased in the Mission through the city’s Small Sites Program, nor the housing the neighborhood will get with its $50 million of Proposition A funds. Community groups are currently working with the housing office to hammer out the details, but voted last month to prioritize the purchase of two to three sites in the neighborhood for an additional 200 units. Podell has faced strong opposition to the project for months, though that opposition split last summer when he began working with tenants on their relocation. The remaining resistance compelled Podell to delay the project last September, however, and that pushback is sure to continue. Disclosure: Nick Podell is a reader member of Mission Local. If you build nothing, all existing housing becomes gentrified. That’s the situation we’re in right now. Does this anti-housing activist think the existing housing stock in the Mission is cheap? All housing in the city is renting/selling for luxury prices, whether it was built this year or 50+ years ago. People with money are moving here, and not building new homes for them to live in just incentivizes them to cause displacement via evictions and buyouts. It’s slimy and wrong to take away someone’s rent controlled home, but unfortunately people are legally entitled to do so in come cases. We can and should make evictions more difficult and more expensive, but the other side of the coin is disincentivizing evictions by building new homes that rich people can move into without displacing existing residents. 100% affordable development is a laudable goal, especially in historically lower-income neighborhoods. But where is the money for that? Inclusionary requirements have created precious few affordable homes for a handful of lucky lottery winners. It’s hard to take these anti-housing activists seriously when they don’t have a concrete actionable plan to achieve their desire of more affordable housing. I would love to see this activist community abandon their obstructionist mentality, and embrace the types of changes that could actually help make the city more affordable for everyone. Prop 13 reform, as well as a higher capital gains tax on real estate transfers could generate far more tax revenue for affordable housing than we are currently getting from the 12% BMR requirement. Additionally, building enough homes to meet the needs of our growing population (including the much-hated tech rich) could stabilize prices and reduce the incentive to evict rent-controlled tenants. Its data pretty much says the opposite of “market-rate developments have a “domino effect” of increasing rents throughout the neighborhood”. You’re telling me that the developer donated $27 mil of land for the city to develop below market rate housing on and these so-called community groups are opposed to it? And the city dedicated $50mil to mission housing development? I just don’t understand. By the by, in the former owner of Inner Mission, the last owner/artist who resided in the former Cellspace. This is stupid white-so-called-progressive-BS. I’ve been part of “the community” for decades, and the activists and organizations you interview here don’t represent my views in the slightest. It would be great (and good journalism) if you would try to publish more than one side of the story. Obviously the developer and his representative have their point of view, but the reaction in “the community” is far from universal, and it’s unfair and misleading to say we “remain opposed,” as your headline states. Me too. I love three blocks from there and I fully support this project. Large parts of “the community” support this project but they don’t scream the loudest. This project would provide housing for a broad range of income levels in the Mission. I agree this article is one-sided. This story refers to several Mission groups, ones that have tremendous overlap of members and “community organizers” and who shout the loudest. Nothing wrong with loud political noises but it would be more honest to call the groups Mission Inc. Oh, and let’s not forget how many of the leaders of Mission Inc either live outside the district and commute from the East Bay to engage in their advocacy and earn a paycheck.